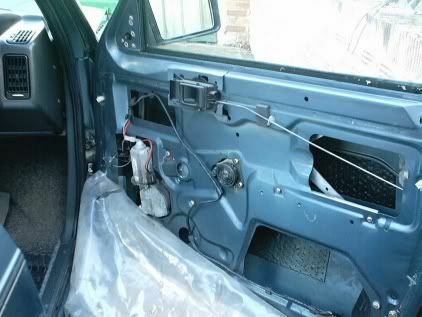 Weekend of 8th Jan 05 saw the nearside front electric window fixed by opening up the unit and greasing it copiously. 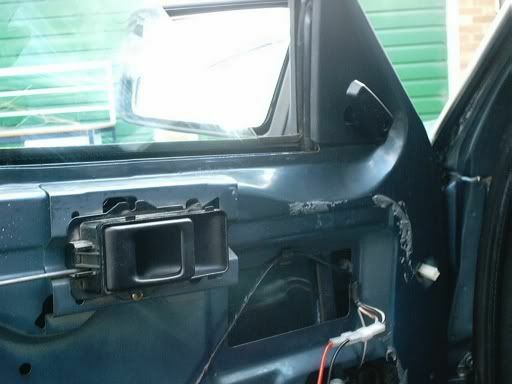 The wing mirror was replaced with a second hand unit. 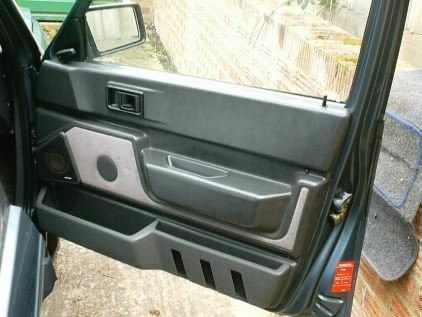 All fairly straightforward but note that removal of the door trim was hindered by a screw not seen below the storage compartment in the door trim panel - luckily it did not break on my inept removal assuming it was just a clip that could be pulled out. Oh what foolishness. 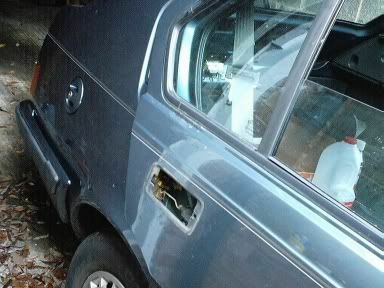 The new door mirror was only dropped once and very luckily survived. Door hinges, catches and window mechanism oiled and greased and other bits of trim sorted. Weekend of 16th Jan 05 saw the start of work on the offside interior and removal of rear seats for vacuuming and washing. The picture shows them drying out after their clean-up. 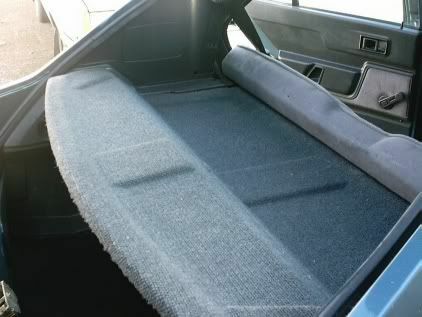 The dirt and junk under the rear seats was cleaned out. 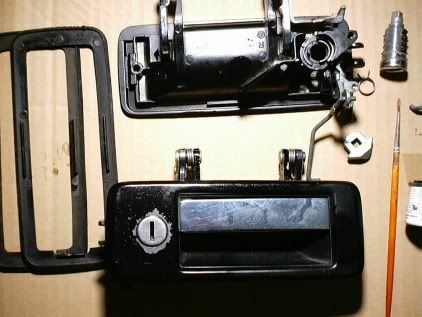 The rear offside broken door handle and interior door-pull mechanism (which was also broken) were removed for replacement with second-hand units. Other cleaning jobs done to headlining and rear carpets. 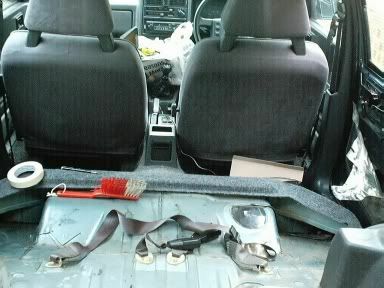 The weekends of 22/1/05 and 29/1/05 saw work to the boot including cleaning out, rubbing the plastic trim with colour cut to tidy up the many scratches, washing the boot rug (plan is to make a smarter rubber cover for the old rug), start of work to the hatch, including replacement of the wiper motor. Removing the spare wheel revealed some spots which have rusted right through. 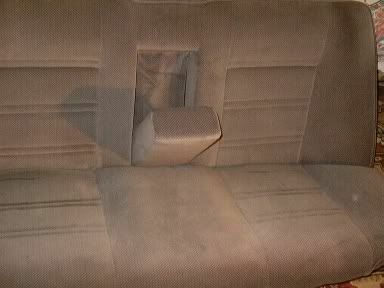 Backseats were re-fitted and second-hand plastic floor-mats. Perhaps Blue Bess is starting to look how she should. Weekend of 5/02/05 saw some work to trim e.g. cleaning front carpets and new glove box which arrived in the post, sadly with some damage which was repaired with superglue - will not show. Rear wiper motor, new blade and trim cover panel now fitted and working fine. Rear screen heater and washer both tested fine. 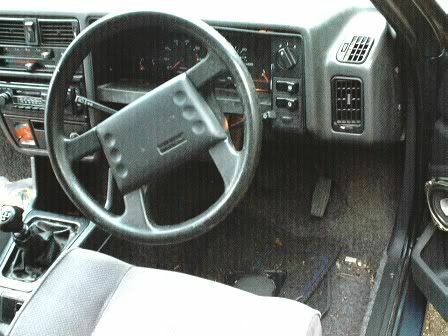 The plan is to move on the transmission tunnel cover and the driver's instruments which the pictures below (don't) show still have considerable grot to be dealt with. Weekends up to the end of Feb 05 have involved cleaning out the transmission tunnel trim as well as work on repairing an old boot board - a gift of a colleague from a burnt out 340 found in a kent scrapyard a few years ago. Use of glue, clamps and papier mache technique plus a coat of paint restored it to a reasonable condition and it fits. Alas, its not the original colour (blue) but it matches well. Feb 05 has also seen a new rubber boot mat, cut to the pattern of the original felt mat. 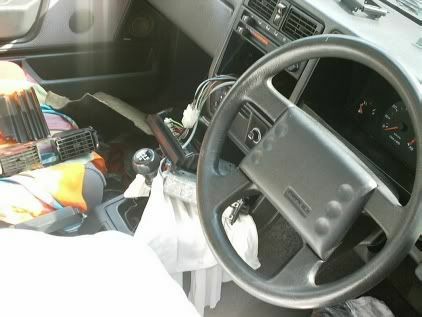 Secondhand trim items arriving in the post that have been fitted include front near side speaker, smarter ash trays and gear lever gaitor, strut top trims under bonnet and the plastic panel above the windscreen. 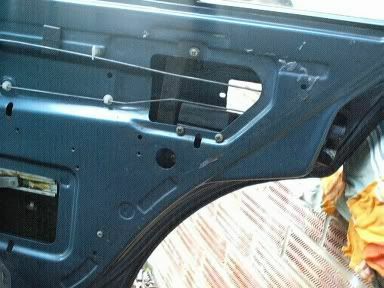 The latter marks a minor achievement - finding this panel broken was one of the most despairing factors when I first bought the car and was coming to terms with the scale of the work needed to tidy it up! Front near side underdash soundproofing and trim re-fitted and plastic door hinge caps fitted all round. 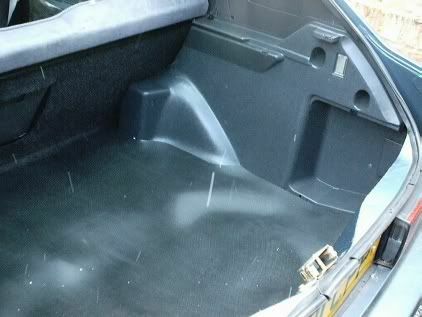 The pictures below show the new boot mat and the white streaks.... yes, they are are falling snowflakes. 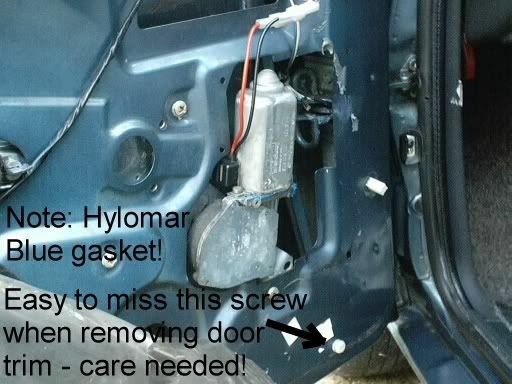 The weekend of 6 Mar 05 saw the repair of the drivers door lock which had been somewhat knackered by someone's efforts to break in at some stage (clearly a thief without an eye to his street cred). 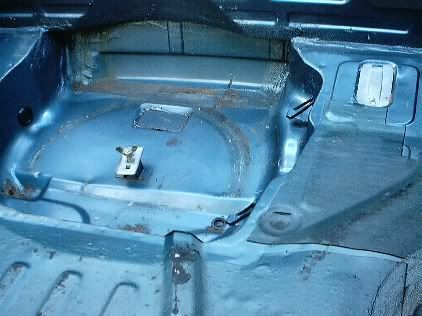 What should have been a smart keyhole was a mangled cavity - another despairing factor when the car was collected. 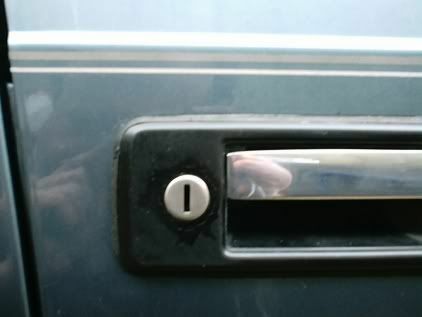 However a few hours spent on removing the old lock, swapping the levers into a second hand unit, a touch of paint and re-fitting it to the car has finally restored the exterior appearance of the door lock to a wonderous condition. 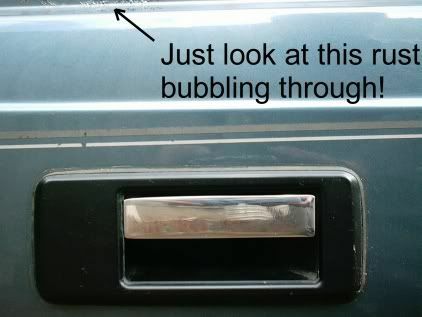 Stare hard at the photo of the door handle and you will make out the reflection of a balding, ugly man photographing his keyhole - only on the internet! 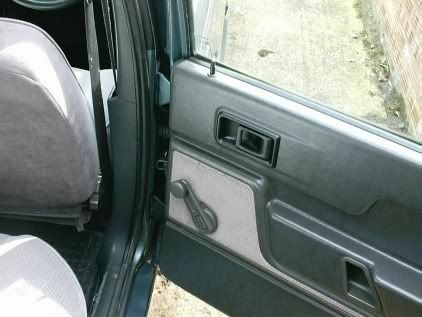 Likewise, the interior door trim was re-fitted to similar splendid effect (see below) along with second hand door pull and speaker in better condition than the original items (infinitely better). 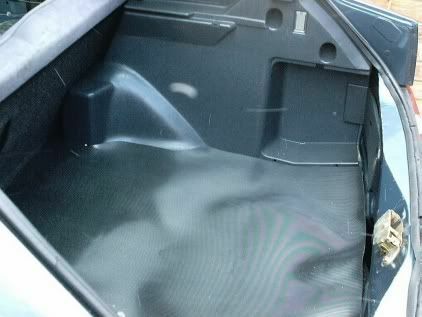 Weekends up to and including Easter (27/3/05) saw replacement of the boot seal with a new genuine volvo item (only half the price of the car) and the construction or rather cutting-out and painting of a plywood cover for the spare wheel in the boot. 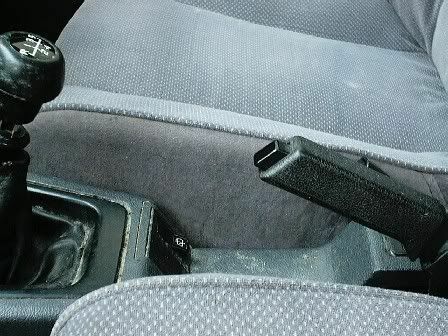 Work on the front dash and centre console has confirmed that all seems to be reasonably present and correct without too much meddling by former owners - see below! 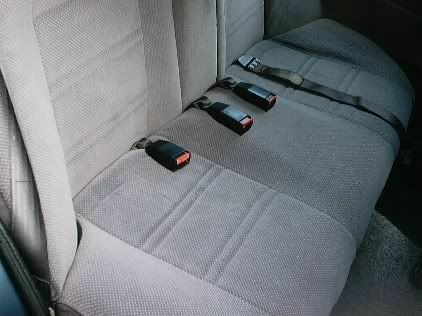 The air vents each side of the hazard switch have been replaced with second hand items in immaculate condition and likewise the inner offside rear door handle has also been replaced. 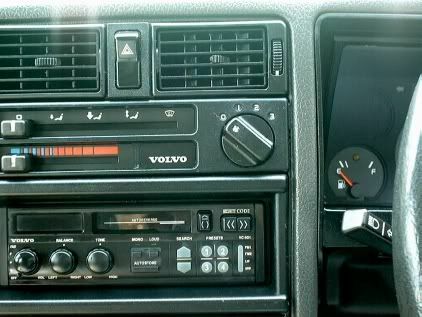 Work on the radio will involve replacing the same said or sad item with a genuine 80's volvo unit - just waiting for the cables to arrive. 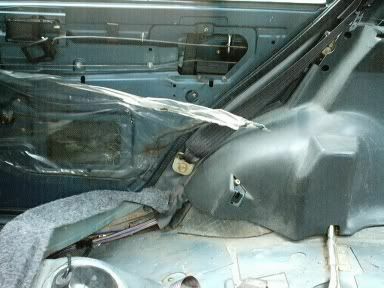 After this all that remains to be done to the domestic parts of the car is to fix the boot lock and to replace the rear offside door handle. 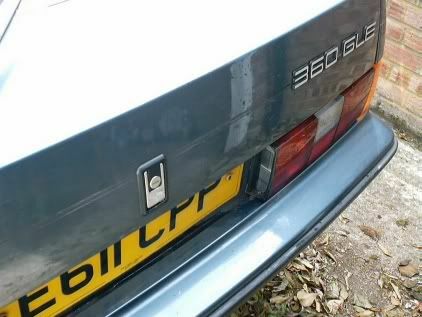 Some things still don't work - like the integral warning lights for the following switches: hazard lights, fog lights and the rear windscreen heater. All very puzzling but no doubt will be cured eventually. Weekend of 3/4/05 saw the replacement radio, a VC601 (see below) wired up, decoded and working fine. 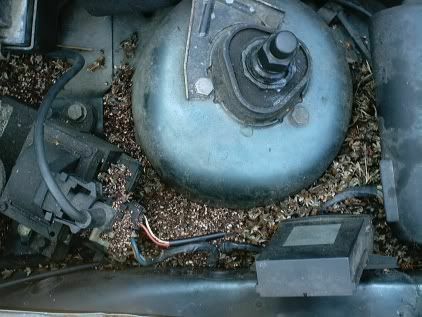 Work under the bonnet has begun with cleaning out the mouse nest (see below) and replacing one of the bodged up battery terminals. Other under-bonnet work included replacing some hose clips, cleaning out the expansion tank, refilling with anti-freeze and general clean up of engine bay with paraffin and Jizer. The pictures below were taken prior to clean-up! 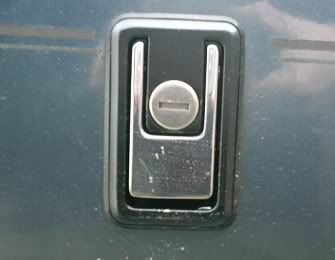 Work on weekend of 10/4/05 saw the boot lock fixed finally by replacement of inner lever and its little plastic catch. All working fine. 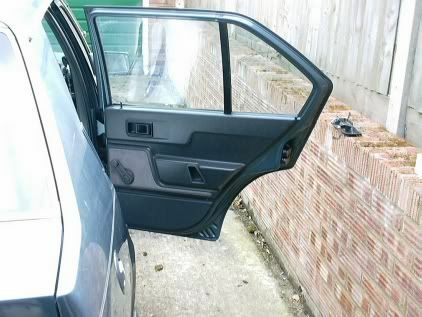 In addition, the rear offside door lock was replaced with second hand item and the interior trim refitted. 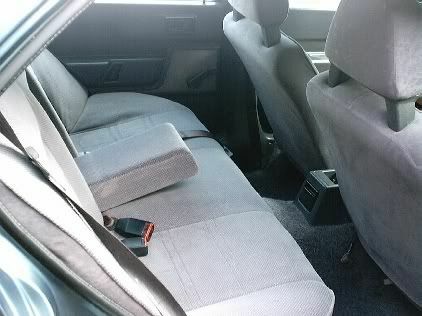 Finally, its looking like the interior trim jobs are almost complete. Truly magical moments for Bessie Blue. 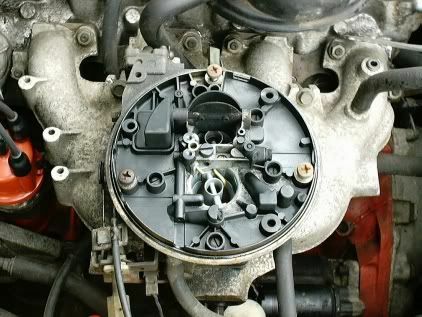 Work on the ignition shows that the leads, plugs and distributor cap are reasonably OK. Just corrected a slight 180 degree misfit of the dizzy cap and discovered that one of the plugs (number 3 from front) has been badly cross-threaded into its hole. Lets hope the spark plug thread chaser can sort this out or its a head off jobbie which is not to be entertained lightly - thoughts of warping heads and professionals causing yet further engine abuse. Work on the rear door confirms just how bad the rust is below the quarter light which will eventually need a window-out job on both sides. This will be left to the very last of the last. Weekend of 17/4/05 saw some dismantling and checking of the fuel system. This included cleaning out the float chamber of the carburettor, changing the fuel filter and removal of the fuel pump for checking the diaphram, etc. All seemed fine except for the fact that the fuel pump bolts were only finger tight - perhaps they had worked loose giving low fuel pressure that was responsible for the very poor starting. Time will tell. The thread of the number 3 spark plug also was restored - all life-changing stuff! 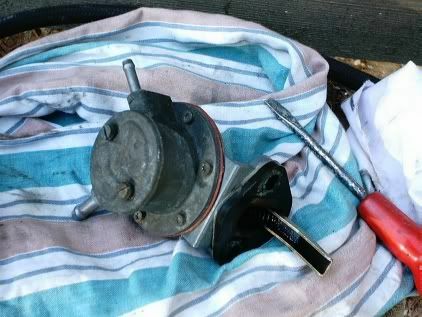 The next few weeks (up to 21/5/05) saw much meddling with the carburettor (see below) to try and sort out its various problems. The car starts on the button which is a big improvement but on warming up it idles much too fast at 2000 rpm. Attempts at adjusting the mixture and slow running screws all have no effect at all on getting it to idle at a more reasonable tickover speed. Likewise replacing the gaskets between it and the inlet manifold had no effect either. Finally, on dismantling it again, a sealed-in washer for a plastic terminal of an electrical connection breaks up and then decide to try getting another carb from somewhere. Find someone who can supply two for 50 quid. Bargain. 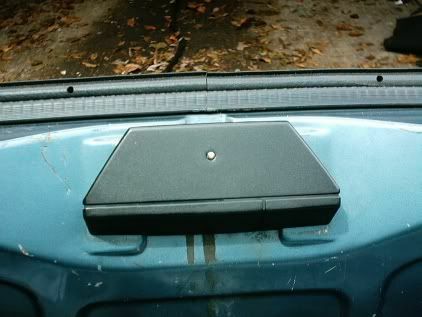 In amongst this doom and gloom one ray of hope is the arrival of a new boot catch cover, as shown below. Marvellous. The long weekend of 28/5/05 saw the problem with the carburettor finally cured. It was operator error. I had reassembled it incorrectly such that a plastic pivot in the throttle flap mechanism was not engaged in the choke cable mechanism. Anyhow the two spares had yielded the final clue as to what I had done wrong and a replacement washer. Bargain. All put back together properly with better (i.e. 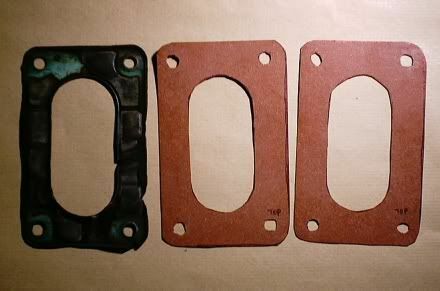 thicker) gaskets than above. A few tweaks to the tickover speed and the car now idles well and the mixture has been set by strengthening it (i.e. undoing the mixture screw) until it runs smoothly. I could not set it with a Colortune plug due to difficulty in seeing a yellow flame as the mixture is enriched - this engine must be too modern! Removing the valve cover and checking the valve clearances showed all to be OK (0.012") so no new shims needed and the nightmare of fitting them avoided altogether. 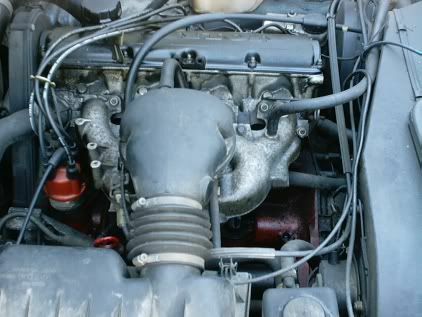 Work on replacing the cam belt begins with removal of the viscous fan, the alternator pulley and the upper cam belt cover. Weekend of 4/6/05 saw the cam belt replaced with a new one which involved removal of the power steering pump, radiator shroud and then the main pulley. 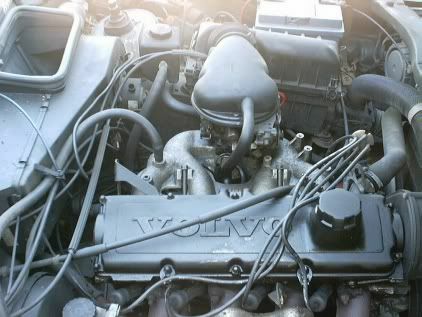 With advice from the volvo300mania website, this was removed by putting spark plugs back in, chocking the wheels, putting car in 5th gear, putting on the handbrake and then using a large wrench on the central bolt. 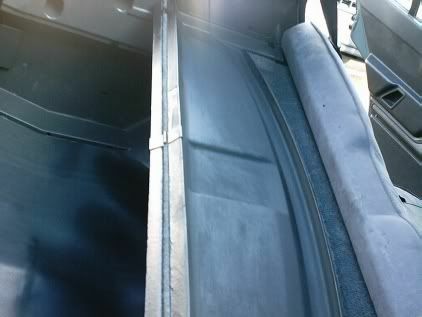 The lower cam belt cover was removed, and the old cam belt slit all along the middle with a carpet knife. The outer half of the old belt was removed and the new one was slid into its place after pulling the tensioner back. The remaining half of the old belt was cut out and the new one slid fully into place. The alignment of the timing marks on the engine was checked after several complete turns and the process of putting it all back together begun with the cam cover being re-fitted! Weekend of 11/6/05 saw the old and knackered radiator (see above) removed which unfortunately revealed some rusted-through metal near one of the radiator mountings. Scraped off as much rust as possible and painted it with black Smoothrite. 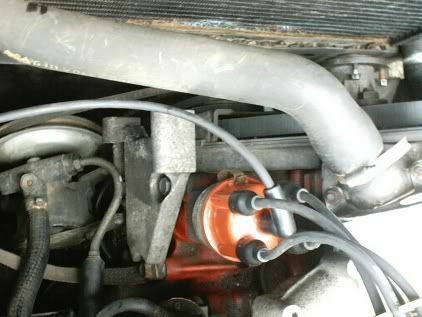 The main pulley, alternator and power steering pump were re-fitted with new belts. 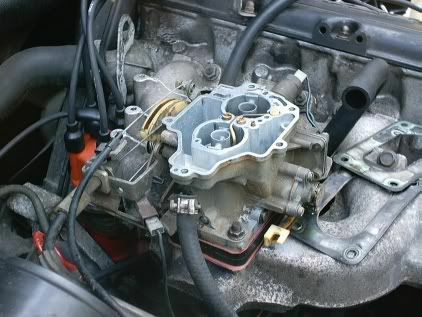 The thermostat was replaced and the valve cover re-fitted along with viscous fan, plugs and leads. Just waiting for the new radiator - hard to get these days. 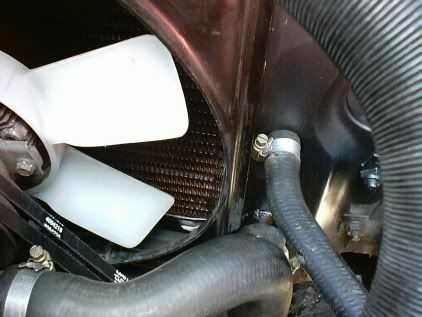 The weekend of 18/6/05 saw the new radiator fitted (see above) and the cooling system re-filled. The oil and oil filter were changed and other bits and pieces done e.g. 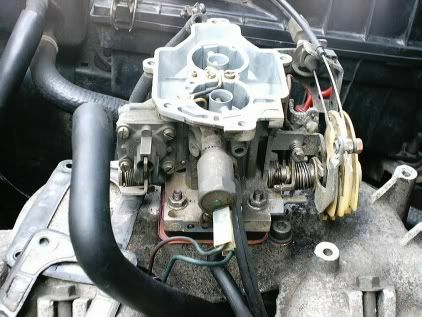 the fuel cutoff relay for the carb (black box near the renix) was replaced with a second hand unit in better external condition, the hose on the outside of the heater box was replaced and the cylinder head leak tackled with Captain Tolley's Creeping Crack Cure. The engine seems to start and run well. What next?